If you want to not only prevent nutrient deficiencies but also have a healthier body that feels good and is more resistant to stress, sickness, and disease . . . and that can train hard without being draggeddown by systemic fatigue and overtraining ... then you want to try TRIUMPH today. If you’ve ever been frustrated by trying to find the “best” multivitamin, or if you wonder whether a multivitamin supplement is even worth the money, we understand. As with most supplements, multivitamins are aggressively overhyped and oversold. Advertisements loudly proclaim that just a few pills / day will ward off disease, optimize hormones, support the gut, enhance cognitive function, and increase energy levels. Some are even bolder, claiming their multivitamins will also help you build muscle, get stronger, and lose fat. That’s the least you should expect from a multivitamin, in reality: the right combination of vitamins and minerals and the right dosages. This would at least plug any dietary holes and ensure your body is getting adequate micronutrients. We think it should do more, though. Namely, there are scores of natural substances that have been scientifically proven to ward off disease and improve health and performance, and we think a multivitamin should include an array of them at clinically effective dosages. Many companies think differently, though. They would rather play the game we’ve already talked about in detail: spend very little on production, exaggerate and even invent benefit claims, and enjoy the large profit margins. Multivitamins are often stuffed with all kinds of micronutrients, regardless of whether we need to supplement with them, and unjustifiably high or low dosages. Unfortunately, not all antioxidants are similar, and regular supplementation of vitamin E above 400 IU / day is now suspected to increase the risk of all-cause mortality. More is not always better. In some cases, multivitamins include nothing else at all in terms of ingredients, but many multivitamins do include additional substances beyond just vitamins and minerals. The normal practice, however, is to jam each serving with proprietary blends of as much stuff as possible to create long, “impressive” nutrition facts panel. While all these things sound great, and we’d love to believe they’re true, when you look into the ingredients and dosages, they tell another story—a story you’re well familiar with by now. Furthermore, a good multivitamin contains other substances known to improve health and performance that are difficult or basically impossible to get in adequate amounts through diet alone. We conducted an extensive scientific review of a wide variety of natural molecules known to meet those targets, and we carefully chose a handful that safely deliver consistent results on all the points given above. The result is the most potent multivitamin on the market built specifically for athletes in which every ingredient is backed by sound clinical research and included at clinically effective dosages. According to the Institute of Medicine, 600 IU / day is adequate for ages 1 to 70 (and 800 IU / day for 71+), but these numbers have been severely criticized by scientists who specialize in vitamin D research. They call attention to the more than 125 peer-reviewed studies that indicate such recommendations are too low and are likely to lead to vitamin D deficiencies. While vitamin K is recommended at around 100 mcg to prevent excessive bleeding, intakes of up to 1,000 mcg appear to cause dose-dependent benefits related to bone health. Despite the tenfold increase in dosage, it is still drastically within the safe limit, as a dosage of 45,000 mcg has been used for years without harm. Like zeaxanthin, research shows that supplementation with lutein improves eye function and preserves eye health. The two tend to be supplemented alongside each other. If you want to not only prevent nutrient deficiencies but also have a healthier body that feels good and is more resistant to stress, sickness, and disease . . . and that can train hard without being draggeddown by systemic fatigue and overtraining . . . then you want to try TRIUMPH today. 70. Augmentation and proliferation of T lymphocytes and Th-1 cytokines by Withania somnifera in stressed mice. 71. "A standardized Withania somnifera extract significantly reduces stress-related parameters in chronically stressed humans: a double-blind, randomized, placebo-controlled study." (2008). 72. A double-blind, placebo-controlled evaluation of the anxiolytic efficacy ff an ethanolic extract of withania somnifera. 73. Naturopathic care for anxiety: a randomized controlled trial ISRCTN78958974. 74. Clinical Evaluation of the Spermatogenic Activity of the Root Extract of Ashwagandha (Withania somnifera) in Oligospermic Males: A Pilot Study. 75. In vivo effects of Ashwagandha (Withania somnifera) extract on the activation of lymphocytes. 76. Effects of eight-week supplementation of Ashwagandha on cardiorespiratory endurance in elite Indian cyclists. 77. Withania somnifera reverses Alzheimer's disease pathology by enhancing low-density lipoprotein receptor-related protein in liver. 79. Terminalia arjuna reverses impaired endothelial function in chronic smokers. 80. Inhibitory effects of Terminalia arjuna on platelet activation in vitro in healthy subjects and patients with coronary artery disease. 81. Effects of Withania somnifera (Ashwagandha) and Terminalia arjuna (Arjuna) on physical performance and cardiorespiratory endurance in healthy young adults. 82. Aqueous extract of Terminalia arjuna attenuates tert-butyl hydroperoxide-induced oxidative stress in HepG2 cell model. 83. Pentacyclic triterpenes from Terminalia arjuna show multiple benefits on aged and dry skin. 84. Cissus quadrangularis reduces joint pain in exercise-trained men: a pilot study. 85. Anti-inflammatory effect of ethyl acetate extract from Cissus quadrangularis Linn may be involved with induction of heme oxygenase-1 and suppression of NF-κB activation. 88. Free radical scavenging profile and myeloperoxidase inhibition of extracts from antidiabetic plants: Bauhinia forficata and Cissus sicyoides. 89. Coenzyme Q(10) improves endothelial dysfunction of the brachial artery in Type II diabetes mellitus. 90. Coenzyme Q10 improves endothelial dysfunction in statin-treated type 2 diabetic patients. 91. Effects of coenzyme Q(10) on LDL oxidation in vitro. 92. Protective effects of in vitro treatment with zinc, d-aspartate and coenzyme q10 on human sperm motility, lipid peroxidation and DNA fragmentation. 93. Effects of coenzyme Q10 supplementation (300 mg/day) on antioxidation and anti-inflammation in coronary artery disease patients during statins therapy: a randomized, placebo-controlled trial. 94. Coenzyme Q10 in the treatment of hypertension: a meta-analysis of the clinical trials. 95. Can coenzyme q10 improve clinical and molecular parameters in fibromyalgia? 96. Oxidative stress correlates with headache symptoms in fibromyalgia: coenzyme Q₁₀ effect on clinical improvement. 97. The effects of Xanthigen in the weight management of obese premenopausal women with non-alcoholic fatty liver disease and normal liver fat. 98. Fucoxanthin from edible seaweed, Undaria pinnatifida, shows antiobesity effect through UCP1 expression in white adipose tissues. 99. Anti-obesity and anti-diabetic effects of fucoxanthin on diet-induced obesity conditions in a murine model. 100. Fucoxanthin exerts differing effects on 3T3-L1 cells according to differentiation stage and inhibits glucose uptake in mature adipocytes. 101. Long term effects of lutein, zeaxanthin and omega-3-LCPUFAs supplementation on optical density of macular pigment in AMD patients: the LUTEGA study. 102. Secondary analyses of the effects of lutein/zeaxanthin on age-related macular degeneration progression: AREDS2 report No. 3. 103. A dose-response meta-analysis of dietary lutein and zeaxanthin intake in relation to risk of age-related cataract. 104. Plasma lutein and zeaxanthin and the risk of age-related nuclear cataract among the elderly Finnish population. 105. Improvement of retinal function in early age-related macular degeneration after lutein and zeaxanthin supplementation: a randomized, double-masked, placebo-controlled trial. 106. Effect of lutein and zeaxanthin on macular pigment and visual function in patients with early age-related macular degeneration. 107. The effects of a lutein-based supplement on objective and subjective measures of retinal and visual function in eyes with age-related maculopathy -- a randomised controlled trial. 108. Dietary and lifestyle risk factors associated with age-related macular degeneration: a hospital based study. I’ve heard that multivitamins a waste of money. Why are you selling one? Multivitamin supplements have taken a beating in the press over the last decade, and for good reason. Many are stuffed with all kinds of vitamins and minerals, regardless of whether we need to supplement with them, and dosages are often too low to provide any real benefits or too high, which can be harmful to our health. So yes, those types of multivitamins are a waste of money. But TRIUMPH isn’t one of those kinds of multivitamins. Instead, TRIUMPH was carefully formulated to address actual micronutrient deficiencies common in Western diets. That’s why it contains proper dosages of 22 essential vitamins and minerals chosen to prevent key micronutrient deficiencies, such as vitamins D and K, zinc, magnesium, and more. It also contains clinically effective dosages of 14 additional ingredients scientifically proven to improve health, performance, and longevity. These are substances that we aren’t likely to get in adequate amounts through food alone, such as N-Acetylcysteine, CoQ10, fucoxanthin, and zeaxanthin. The bottom line is TRIUMPH is in a league of its own. We didn’t invent the multivitamin. We just perfected it. TRIUMPH is pretty expensive. Why should I buy it over cheaper alternatives? As consumers, we know that we generally get what we pay for. This is especially true with supplements because while some expensive products are junk, cheap ones are usually worse. They're made with the lowest quality forms of vitamins and minerals you can buy. They leave out or underdose essential ingredients like magnesium and vitamins D, K1 and K2, and B12. They contain little or nothing additional to further benefit your health. It contains higher quality (more expensive) forms of vitamins and minerals and proper dosages of each, and clinically effective dosages of 14 additional supplements such as aged garlic extract, CoQ10, N-Acetylcysteine, cissus, and olive leaf extract. You can (and many people do) buy many of these supplements separately, but that gets very expensive and fills your cupboard with bottles that you have to dig through every day. TRIUMPH solves both of these problems, making it affordable and convenient to take so many healthful ingredients. 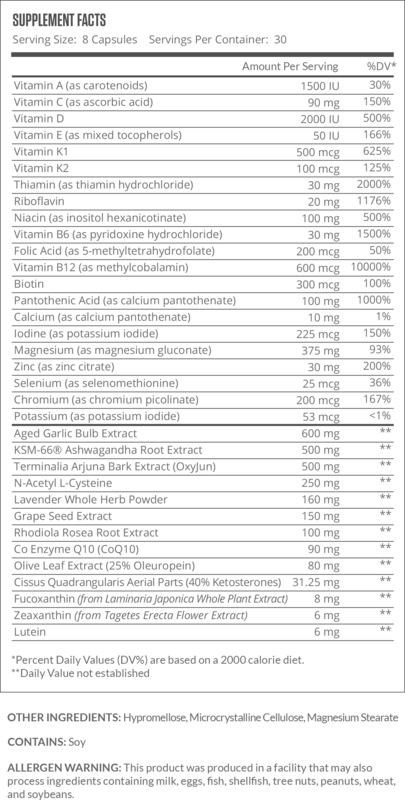 In terms of TRIUMPH, when you compare it to other multivitamins, it looks like it has “super-doses” of various ingredients like K1 and K2, magnesium, and B12. These dosages aren’t inordinately high, though. These are the amounts required to noticeably improve health and performance. What type of effects should I notice when I take TRIUMPH? The most common things we hear from customers are noticeable improvements in energy and mood, lower stress levels, more mental clarity and focus, and better recovery from workouts. This makes sense given the sheer number of ways that TRIUMPH can benefit your body, ranging from improving glucose (blood sugar) control to liver health, blood pressure, heart health, and much more. When you assist some of the most important physiological mechanisms in the body, just about everything runs better. Let’s also not forget that TRIUMPH can confer quite a few benefits that you won’t necessarily feel. For example, if your blood flow and cholesterol profile improves, your risk of heart disease can drop significantly, but you may or may not notice it. Another example is boosting your immune system. You may not notice anything change in your day-to-day living, but you’ll be much more resistant to sickness. Why are some ingredients in TRIUMPH much higher than the RDI? In some cases, increasing intake of a vitamin or mineral above RDI can improve health or performance without side effects or risk of toxicity. 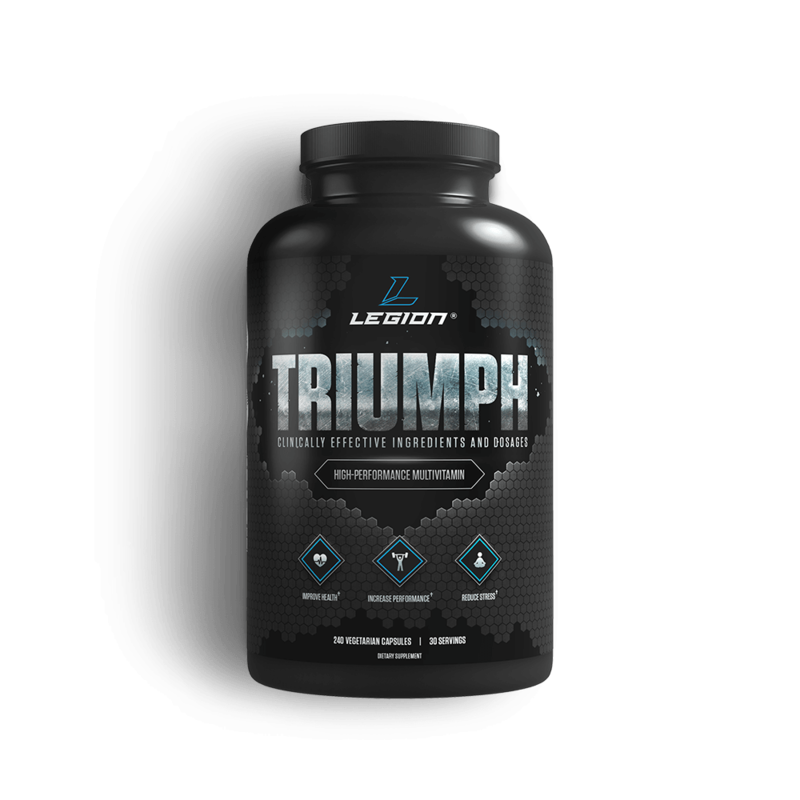 TRIUMPH provides 600 mcg per serving (1000% higher than RDI), and the reason for this is higher dosages are associated with improvements in depressive symptoms and are thought to support general cognitive function, and are known to be safe and non-toxic. I already eat a healthy diet. Can TRIUMPH help me? Many people don’t get enough zinc, magnesium, and vitamins D, B12, and K1 and K2 in their diets, for example. It will provide you with a variety of healthful substances that you aren’t getting in your diet. Rhodiola, grape seed extract, and ashwagandha are some of our favorites. Can I take TRIUMPH instead of eating fruits and vegetables? A multivitamin can’t replace a vegetable-rich diet, which is why TRIUMPH is meant to supplement your nutrition, not serve as a sole source of it. The reason for this is fruits and vegetables contain more than just vitamins and minerals. They also provide other types of phytonutrients that you can’t get through vitamin and mineral supplements. Two good examples of this are sulforaphane and anthocyanins, which are found mainly in broccoli and blueberries, respectively. These molecules are known to have a variety of beneficial health effects but are not found on food labels, which focus only on essential nutrients vital to life. Why is there no calcium in TRIUMPH? We chose to leave calcium out because most fitness folk eat a very high-calcium diet (a single serving of whey protein contains 11% of the DRI, for example). Why is there no copper in TRIUMPH? A copper deficiency is basically unheard of. Copper is very abundant in the average Western diet and water supply. Despite being a vital component of an important antioxidant enzyme, there is no evidence to even suggest that simply providing more copper will increase the activity of this enzyme. There is evidence to suggest that, in genetically susceptible people, more copper than needed increases the risk of Alzheimer's disease. Thus, we felt there was little to gain by adding copper to TRIUMPH. You’ll know TRIUMPH is a real product by the results. Is TRIUMPH suitable for men and women? Both men and women can benefit equally from TRIUMPH. Because it’s a “one-size-fits-all” formulation, some of the vitamins and minerals will be slightly higher that some women need, but not so high as to cause problems. 8 caps per day!? Why, Mike, why!? We had a hard time settling on a serving size because the fewer the pills per serving, the fewer goodies each serving can provide. When we were researching TRIUMPH, we started by looking at what we could do with 2 pills per day. It would have provided so little in the way of effective ingredients that we would rather not even offer a multivitamin. 4 pills per day was better, of course, but still disappointing. We wanted to create a multivitamin supplement unlike any other on the market and that wasn’t it. We began to like the formulation at 6 pills per day and contemplated making this the serving size. When we saw how much better we could make the product by increasing to 8 pills per day and when we considered how little difference there is between taking 3 or 4 pills twice per day, we made the decision to go with it. The amino acid N-Acetyl-L-Cysteine comes from an animal source.